She looks like she's going to enjoy that one! Fabulous card, I love the image. This is a fabulous card. Nice simple layout and gorgeous image. what a fun card, sylvie!! her cocktail looks yummy! 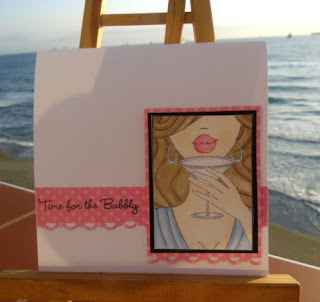 Fab card Sylvie, and so is the one in your last post. Don't know how I missed that beauty! Oh I used this one too - she is fab isn't she. You did a lovely card and coloured her beautifully. Fabulous card Sylvie, very modern! A brilliant card with a fantastic image .. .. great finished look. Loving your colour choices too. Scrabbling and eating out .. .. sounds fun!!! Enjoy your time with your friend. What a lovely card.Like the colours very much. Great card, love the digi image.